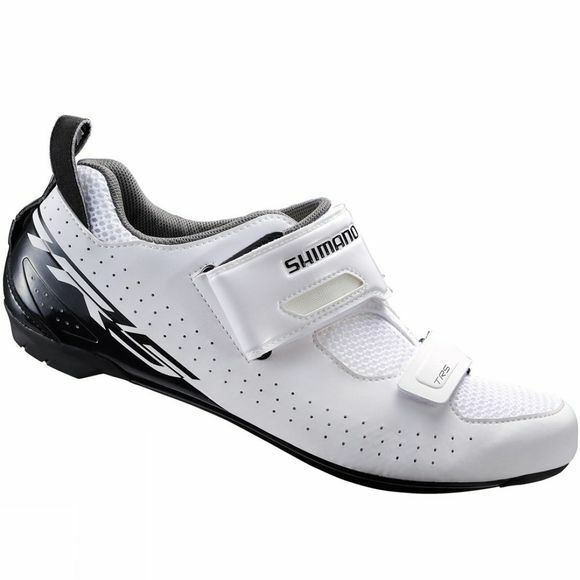 The TR5 SPD-SL shoe is the perfect partner for any triathlon enthusiast. It is super quick and easy to get on with the help of a reversed strap closure and heel strap. When it’s on it is incredibly comfortable. A quick-dry interior is designed for use without socks and a supple synthetic leather with 3D moisture control mesh upper provides comfort and climate control through the miles. And, it even performs incredibly. Shimano Dynalast positions the foot into an ideal ergonomic position for the most efficient up-stroke, and a lightweight glass fibre reinforced-polyamide sole works to provide efficient power transfer on the down-stroke.